Dovetail jigs aren’t the kind of purchase that you should be willing to take a risk on. Not only can a poorly constructed jig make you frustrated while using it, but it can cause your woodworking projects to have poorly fitting joints as well. Dovetail joints are a big deal in cabinet making and furniture, so you definitely want your dovetails to look amazing. That’s why we decided to review a whole slew of dovetail jigs to determine which jig was the best. We’ll get into how we came to our conclusions in a little bit, but our choice for best dovetail jig is the Porter Cable Dovetail Jig 4212 (Amazon | Rockler) by a very narrow margin. Porter Cable makes some of the best dovetail jigs you can buy and our second choice is also a Porter Cable, but we will get into those details in a minute. 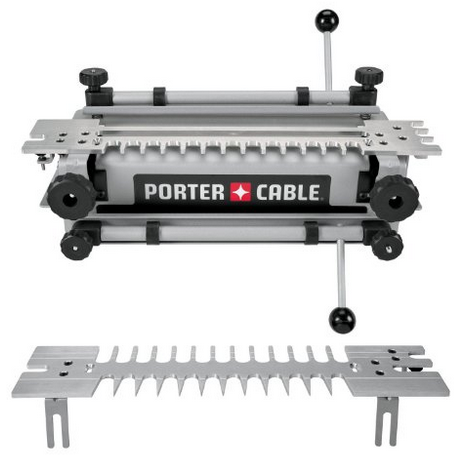 The Porter Cable 4212 Dovetail Jig is a very well built piece of machinery. It is a 12” jig, which is the standard length. If you need a larger jig, read further below as we have a different recommendation if you need something larger. This jig can make half blind dovetails, sliding dovetails, through dovetails, and box joints. The guides on the Porter Cable are thick and made of aluminum, so they are sturdy and won’t bend under pressure. The manual that comes with the 4212 jig is well written and detailed. There is also an advanced manual on the Porter Cable website that can give you even more details if you want. Once the jig is dialed in, it stays put. The main downside to the 4212 jig is that it uses proprietary bushings and router bits. This isn’t necessarily a big deal if you are just getting started and haven’t purchased any bits yet. However, if you already own some dovetail router bits for a different dovetail jig, then you are out of luck using them with this jig. The bits themselves aren’t expensive, but a few people have been annoyed by the fact that they couldn’t use what they already had. The Porter Cable bits can be a little hard to find too. Amazon doesn’t carry them, however Rockler does. Rockler should be one of your primary places to buy woodworking supplies online anyway, so you can always buy them and have them shipped to your house. In second place for the best dovetail jig is the Porter Cable 4216 jig. The only thing the 4216 does that the 4212 doesn’t do is miniature dovetails, which isn’t enough to justify the larger cost for most people. Miniature dovetails aren’t as common as the others, since they are usually only used for small decorative boxes whereas the other joint types are used in box making, furniture construction, and cabinet making. Rounding up the Porter Cable line is the 4210 jig (Amazon | Rockler). This jig can only do half blind dovetails and sliding dovetails. Because of that reduced ability, we don’t really recommend it because it is not nearly as versatile as the other two in the same product line. If a 12” jig isn’t big enough for you and you want to move on to the 24”, be prepared to open your wallet for a much bigger price tag. For the 24” category, we recommend the Leigh D4R Pro 24” Dovetail Jig with an accessory kit from Rockler. This is the ultimate dovetail jig on the market, but it will cost you over $800 to purchase it. You can buy it without the accessory kit for less (Amazon | Rockler) but in our opinion, the accessory kit is definitely worth the extra. The Leigh D4R Pro has adjustable guides so you can have any spacing you want for your dovetails. That is the ultimate flexibility in your designs. The adjustability means that you can cut dovetails in any length of wood rather than changing the length of your wood to suit the fixed length of the dovetail guide on other jigs. If you are willing to invest in a high quality, well built, and jig that will produce beautiful pins and tails every time. Some of you may be asking why we haven’t recommended a Leigh jig yet. Well, quite frankly, the price is a huge barrier on the Leigh systems. The Leigh Super 12 Dovetail Jig (Amazon | Rockler) is at least $100 more expensive than the Porter Cable 4212, however it does have a huge benefit that the Porter Cable does not. The Porter Cable has a fixed width dovetailing. The Leigh jig has the benefit of having adjustable pins so that your dovetails can be any width that you want. You can even have variable spacing if you desire that in your woodworking project. Given the flexibility of this jig, it is easy to see why the extra money is highly worth it for some professionals. We simply don’t feel that it is the best jig for the majority of woodworkers. Since most woodworkers are going to desire fixed width, the Leigh Super 12 dovetail jig would only cause confusion and possible mistakes if the pins are not set perfectly at even spaces. So if you need the flexibility of variable spacing, this would be the jig for you. On the lower end of the price spectrum is the Rockler Complete Dovetail Jig. The jig is well constructed and with over 130 reviews maintains a solid 4 out of 5 star rating. It is a good jig for those who are beginning and not willing to spend a fortune on one of the earlier mentioned jigs. The Rockler dovetail jig does have some drawbacks though which keeps us from fully recommending it. The dust collection attachment blocks some of the screws needed for adjustment. If you never change the settings, this might not be a huge deal to you, but it will be for most users. In addition to being difficult to set the adjustment screws, the jig overall is difficult to figure out. Most users ended up abandoning the included instruction manual in favor of YouTube videos to learn how to use the jig. While it is cheaper than the Porter Cable 4212, we don’t feel that the price is low enough to justify purchasing this instead of the much more robust Porter Cable system. The dovetail jigs to stay away from are the Craftsman jigs from Sears. They are poorly constructed and some of them have plastic guides, which are almost useless for any real work. They will bend and can be damaged by the router bit if you are not extremely careful. Basically, do yourself a favor and don’t buy the cheapest jig you can find. You will regret it and end up returning it and buying something else.